Aubrey Schwartz is about to connect for a basehit that drove in a run for Miami Trace in their game against Washington Friday, April 12, 2019 at Miami Trace High School. At left for Washington is catcher Maddy Jenkins. Washington’s Brooklyn Devenport makes the play at third base during a Frontier Athletic Conference game at Miami Trace High School Friday, April 12, 2019. 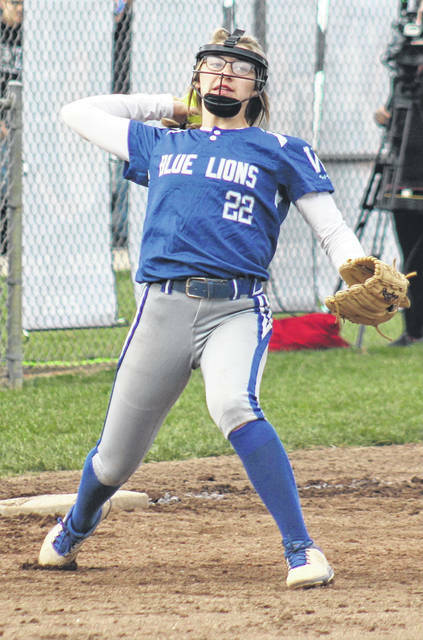 The Washington Lady Blue Lions varsity softball team visited Miami Trace High School Friday for a Frontier Athletic Conference match-up, ending the first round of conference play. Miami Trace won the game, 7-1. Olivia Wolffe was the winning pitcher for Miami Trace. She pitched seventh innings with four hits and one earned run. She struck out nine and walked two. Makenna Knisley started for Washington and pitched six innings. She allowed 14 hits and seven runs (six earned) with no strikeouts and two walks. Offensively for Miami Trace, Ashley Campbell hit her sixth home run of the year, going 3 for 3 with three runs scored. Jessica Camp had two hits, including her fifth home run of the season. Aubrey Schwartz had two hits, scored once and drove in one run. 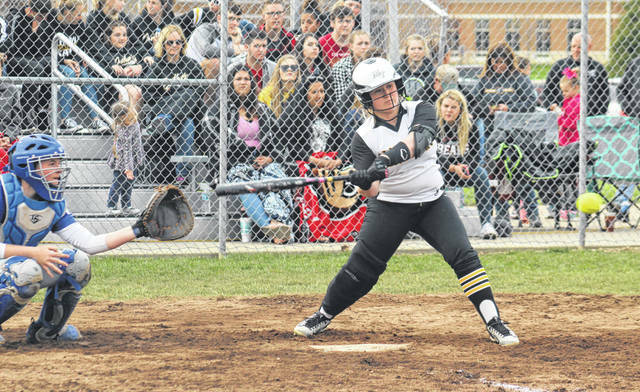 Maddie Mossbarger had two hits and one rbi and Kaylee Hauck had two hits and scored one. For the Lady Lions, Maddy Jenkins and Knisley both hit doubles. Kassidy Olsson had one hit and Kearria Marcum had one hit and drove in one run. Washington took a 1-0 lead in the top of the second when Corynn Chrisman led off with a walk. Olsson bunted her over to second and with two outs, Chrisman scored on Marcum’s hit to center field. In the bottom of the third, after the first two batters were retired, Campbell singled and Sidney Payton singled, with Campbell scoring on the play. Schwartz singled into right field, scoring Payton to make it 2-1. In the fourth for Miami Trace, Krissy Ison reached on an error and was bunted to second by Kylee Rossiter. Ison was out at third and Hauck followed with a single. Wolffe reached on an error that allowed Hauck to score to make it 3-1. The fifth was another scoring inning for Miami Trace. Campbell led off the inning with a home run over the center field fence. Schwartz walked with one out and with two away, Ison singled with Schwartz going to second. Rossiter singled to center, scoring Schwartz for a 5-1 Miami Trace lead. With one away in the sixth, Camp homered over the fence in left field. Campbell followed with a single. With two away, Schwartz singled and Maddie Mossbarger singled, scoring Campbell. “It was a typical Trace-Court House game,” Washington head coach Randy Elzey said. “You can throw the records out the window. Both teams battled to the end. “We played to the last out,” Elzey said. “We had a runner on in the seventh. We had a couple of early moments in the game where we could have scored and we didn’t. We didn’t get into situations where we had our speed on and get the timely hit behind them. “We hit the ball hard tonight,” Elzey said. “Wolffe pitched a good game. “Maddy Jenkins had a good game,” Elzey said. “She hit the ball hard every time up. Their left-fielder (Rossiter) made a great catch of one of Maddy’s fly balls. “I think everyone on both teams gave their best effort tonight,” Elzey said. Washington (1-12 overall, 1-4 FAC) is home Saturday for a doubleheader against Greeneview with the first game at 11 a.m.
Miami Trace (8-1 overall, 4-1 FAC) is taking part in the Circleville Invitational Saturday, beginning at 10 a.m. Miami Trace will play Unioto and Sheridan at 10 a.m. and 2 p.m.
Offensively for Miami Trace: Kaylee Hauck, 2-4, 1 run; Olivia Wolffe, 0-4, roe; Jessica Camp, 2-4, 1 run, 1 rbi, home run (No. 5), fc; Ashley Campbell, 3-3, 3 runs, 1 rbi, home run (No. 6); Sidney Payton, 1-4, 1 run, 1 rbi; Aubrey Schwartz, 2-3, 1 run, 1 rbi; Maddie Mossbarger, 2-4, 1 rbi; Krissy Ison, 1-4, fc, 2 roe; Kylee Rossiter, 1-3, 1 rbi, sac; Piper Grooms, 0-0; Hannah Miller, 0-0. LOB: 10. Offensively for Washington: Brooklyn Devenport, 0-3; Brooklyn Foose, 0-3; Maddy Jenkins, 1-3, 2b; Makenna Knisley, 1-3, 2b; Corynn Chrisman, 0-2, 1 run, 1 bb, sb; Kassidy Olsson 1-2, sac; Meredith Pabst, 0-2, 1 bb; Mallori Tucker, 0-0; Kearria Marcum, 1-3, 1 rbi; Emma Funari, 0-3; Kassie Wiseman, 0-0. LOB: 5.